The Bay building is part of a proposed downtown Winnipeg Amazon campus. You heard the news: Amazon, the multi-billion dollar internet retailer and technology company with over 380,000 employees is looking for a place to set up a second headquarters. Winnipeg, Manitoba wants in and we’re submitting a proposal to be the home of Amazon’s HQ2. We’ve got a central North American location, we’re a transportation and technology hub, we have the most supportive business community in the world and a quality of life second to none. Finding somewhere for up to 50,000 employees to set up shop is no small feat though. Amazon needs space to grow. They’re looking for 500,000 square feet to start with and up to 8,000,000 square feet once their buildout is complete. Luckily, we’ve got plenty of options within Winnipeg city limits that fit the bill. 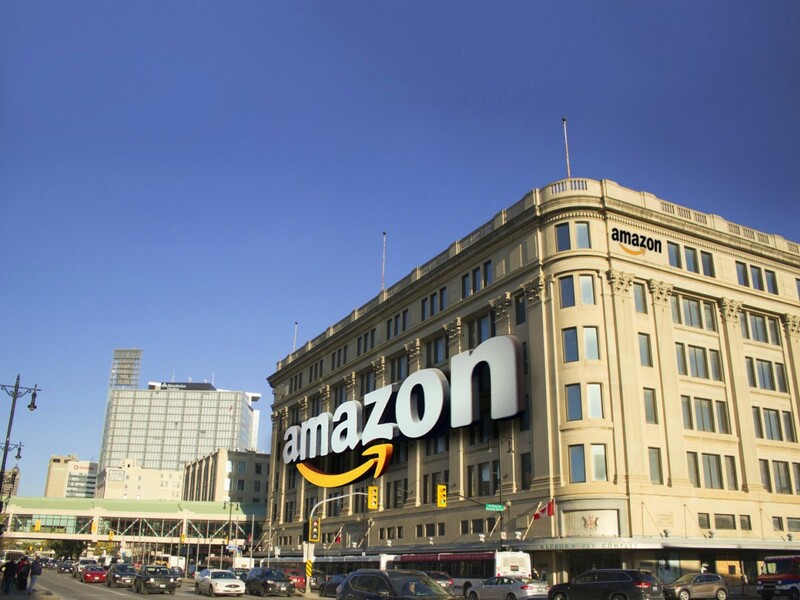 Our partners at the City of Winnipeg have compiled a list of locations suitable for Amazon and we’ve narrowed it down to two unique and perfectly suited locations within the City of Winnipeg. We think Amazon will love the choices we’ve given them. We’ve done our research. We know Amazon is an urban-oriented company that values sustainability and energy-efficiency. With our downtown campus option, the company will occupy multiple buildings that will be connected with a walkway system and concourse. The campus will include unique existing structures ripe for redevelopment and vacant sites that will have new facilities constructed using the latest in energy-efficient building design. The Bay, a marquee heritage building, will be one of the campus anchors. This beautiful, historic seven-floor department store will be redeveloped with additional floor plates added to the facility creating a mix of heritage and modern building design. The Bay connects directly to a large downtown retail shopping centre and office complex which will also be redeveloped with the addition of two new towers to be located on each end of the mall. The downtown campus also includes a large site near Winnipeg’s biggest tourist attractions - the Canadian Museum for Human Rights and The Forks. With new developments like True North Square, SkyCity Centre and the ARTIS REIT residential complex near Portage and Main, Winnipeg’s downtown is booming and we think Amazon’s downtown campus will be the perfect addition to the centre of our city. If there’s a single location in Winnipeg that has become the hub of our technology sector, the University of Manitoba Smartpark is it. Smartpark is located in the south end of the city, right on the campus of U of M, the province’s largest post-secondary institution with more than 29,000 students. The 15 year old park is already home to more than 20 technology, agribusiness and engineering companies and world-class research facilities including the Richardson Centre for Functional Foods and Nutraceuticals, RTDS Technologies and Emergent BioSolutions. It has also helped launch many successful ventures including IMRIS, the Composites Innovation Centre and BASF Canada. What makes the 107 acre site such a perfect fit for Amazon? It’s already an innovative community of high-tech entrepreneurs, industry professionals and university professors. It’s right next door to U of M’s leading Canadian faculties of science and engineering – the perfect pipeline of talent for Amazon, and Winnipeg’s expanded Bus Rapid Transit (BRT) system goes right through the park. When the work day is over, employees can head just across the street to catch a football game or concert at the 30,000 seat Investors Group Field, home of the Winnipeg Blue Bombers. Whether it's the heart of our city or the heart of our tech and education sectors, we think Amazon will love these proposed locations for their second headquarters. That's the Winnipeg advantage. You can find Team Manitoba's full Amazon RFP here.